The Bit Guide is a resource for all equestrian enthusiasts looking for information about horse bits and horse bitting issues. Browse or search our horse bit guide to find information about specific bits and bit families, learn about proper bit sizing and different bit materials, and stay up to date on issues regarding horse bits in a variety of equestrian disciplines. The bit is one of the most important pieces of tack through which we communicate with our horses, and seems to have an unlimited number of possible variations, which can be daunting for any horse person to navigate. Finding the right bit for a particular horse is partly a matter of trial and error; however, with education, the rider can narrow down the possible choices and have a better idea of how and when to use certain types of bits. Use our bit search to find a specific bit by name, or browse the different categories of horse bits through the menu. 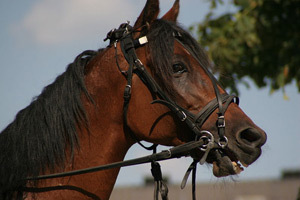 The largest group of bits is the snaffle bit, which acts directly on the corners of the mouth, tongue, and jaw without any leverage, and has the effect of drawing the head upwards and inwards. The action of snaffle bits can range from mild to severe depending on the thickness and shape of the bit. Snaffles take their names from variations in the three primary parts of the bit: the joint(s) (or lack thereof), the cheek/ring, and the mouthpiece, and are grouped accordingly. In practice, snaffle bits can be just about any combination of those three elements. The other large category of bits is the curb bit. These bits have a shank attached to the mouthpiece, supported by a chain under the jaw, adding leverage to the action of the rein. The effect of this leverage is to increase pressure on the tongue and jaw, and add pressure to the poll, which encourages a lowering of the head and increased flexion in the jaw. These bits are more severe and require a sensitive touch to be used correctly. Certain types of curb bits (often called Weymouths) are used in combination with a thin snaffle bit, called a bradoon, to form the double bridle, which is treated as a separate category. The double bridle arrangement is used almost exclusively in upper level dressage, and gives the rider very precise control through the use of two reins. Bits in the pelham category can also be used with two sets of reins, however, they are attached to only one bit. The traditional pelham looks like a curb bit with an extra ring at the mouthpiece, so the bit can be used as a snaffle, a curb, or both, depending on where the reins are attached. We have included other bits with multiple attachment locations in this category, although they are not strictly considered pelhams. These include multi-ring bits, known as elevator bits, the kimberwick, and the boucher. Though they may look different, they work on the same principle as other pelham bits. The final category of bits we consider are the gag bits. These bits look like snaffles, but have two holes through the rings for the addition of an auxiliary rein that provides leverage downwards on the poll. What else will you find at the Bit Guide? In addition to pictures and detailed information about specific bits, we are providing information about what various bit measurements mean and how to choose the best size for your needs, as well as the pros and cons of different bit materials available.